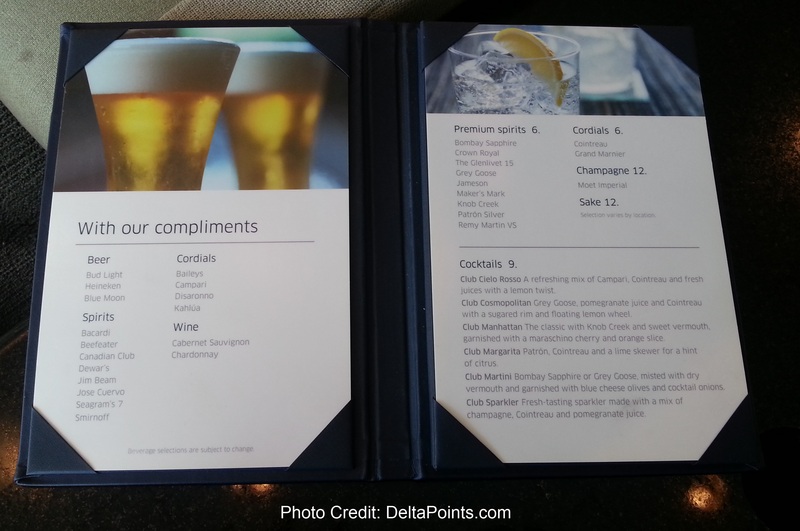 The value of SKY with Delta & TSA Pre is SOOOOO sweet + a weekend giveaway. I have a bit of a long trip report on the way tomorrow from my ski trip to Denver on Delta using my AMEX free companion cert but first a bit that makes all the “hoops” Delta is going to make us jump through in 2014 still worthwhile. Traffic in Denver is crazy. I was hoping it would not be as bad on a Saturday morning for our return flight home and it was much improved over any weekday levels. I dropped off my Advantage rent-a-car (more on that to come) and there was a shuttle just ready to depart for the airport. We get to check-in and the line is 20-30 people deep but the SKY line is empty. We got the standard looks and even more looks when after about 1 min the rep called us over with a wave and an explanation for those in the line, ” SKY PRIORITY” it was definitely one of those DYKWITIA moments! Now I have the phone app for check-in but I DO NOT use it. Why? At this point us Android users can not get a digital HOOU coupon this way (have one on us). So I printed them both to PDF and sent to my phone and used the hotel printer to print my boarding pass. On to security. If you do not have the AMEX Platinum MR cards that pays you back for your Global Entry, please, do yourself a favor and spend the $100 for 5 years and get it. The lines at security were forever long. NO ONE was in the TSA Pre line. We almost RAN through and were on our way to gate side. Today was just about the fastest I have ever made it from drop off to the gates, without question the fastest from rental car off-airport return to gate. 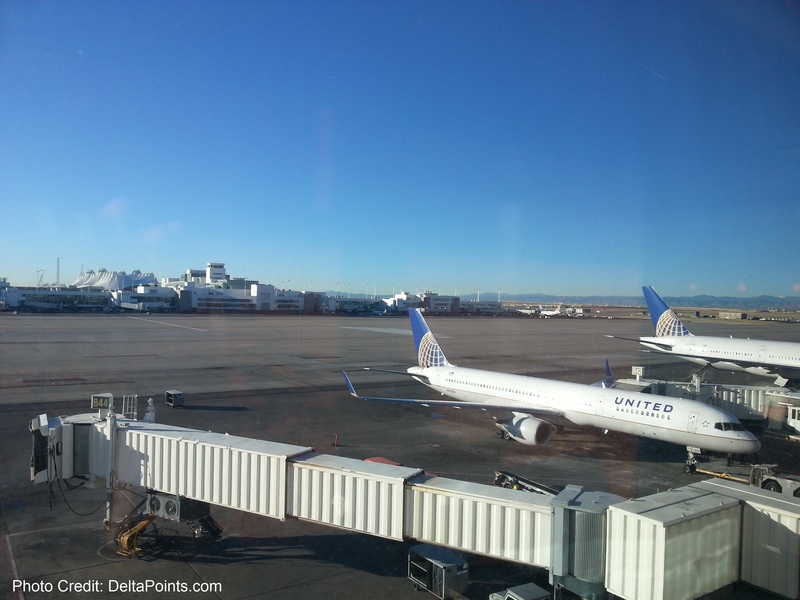 The one thing I did not check ahead was to see where the Skyclub was in Denver airport. As you are saying to yourself in your head now, duh, Rene, there is no Skyclub in DEN. Yup. But, I did have two United club passes from my last Chase United card. So back to B concourse and a short walk to the East side club. 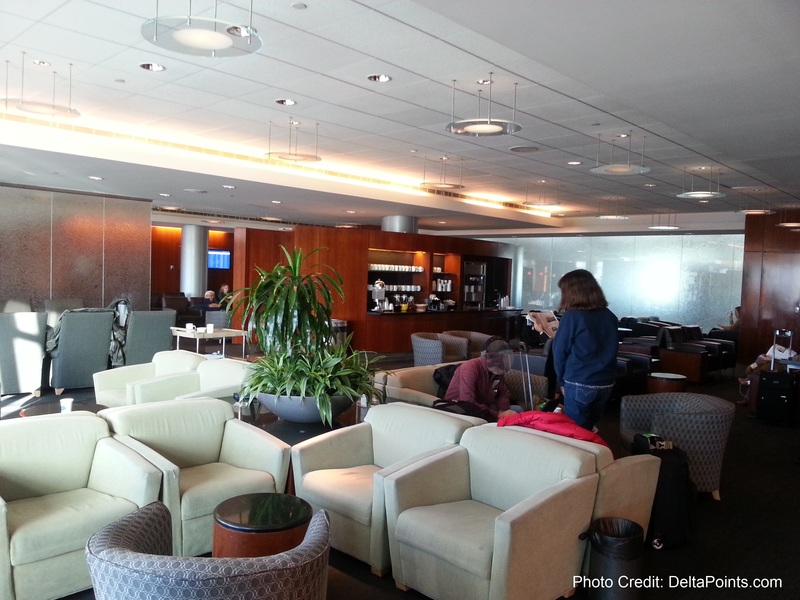 Like my report yesterday from my mileage run, I don’t spend much time in non-Skyteam lounges so it is always fun to compare. The club was nice. Wifi was fast and good and a good amount of power ports. The standard stuff is free included beer & wine, but they sell premium drinks too. I opted for juices and a pastry and Lisa had a latte. 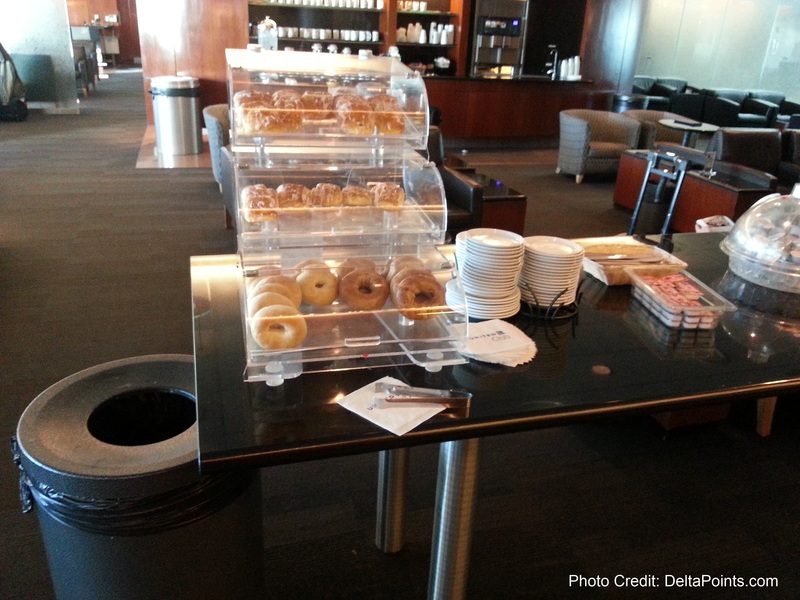 (She mentioned that Delta’s coffee machines are much simpler to operate and serve a neater cup than United’s version). 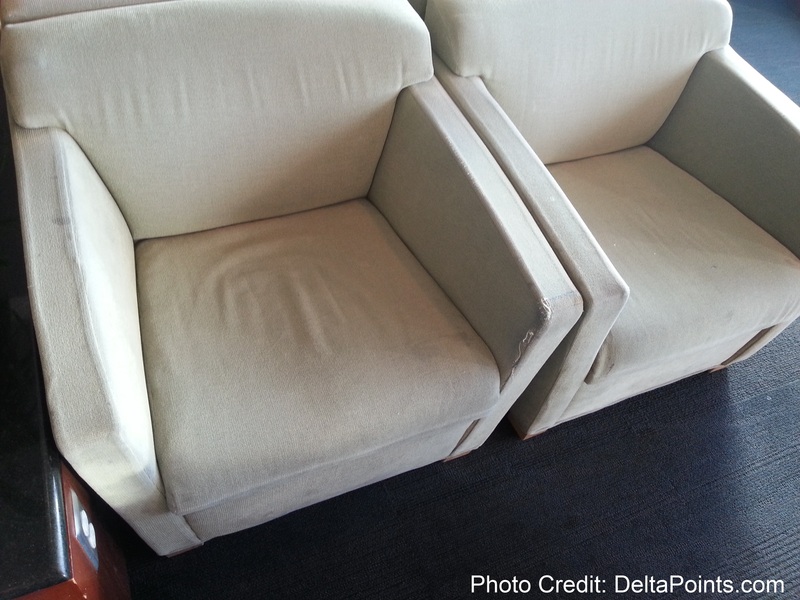 The club was a bit more up-to-date that the 80’s decor of the PIT US AIR Club but not very clean and the furniture, oh my, looked like a HERD of cats had attacked them as scratching posts. The only snag in this perfect start to the trip home was that there was an equipment change on the DEN-ATL flight. We were in on a 757 with the front row only 2 seats. Perfect for my Lisa & Me. The new 757 was all 3 & 3 and the front row was filled with other flyers than me. We ended up in row two of EC. 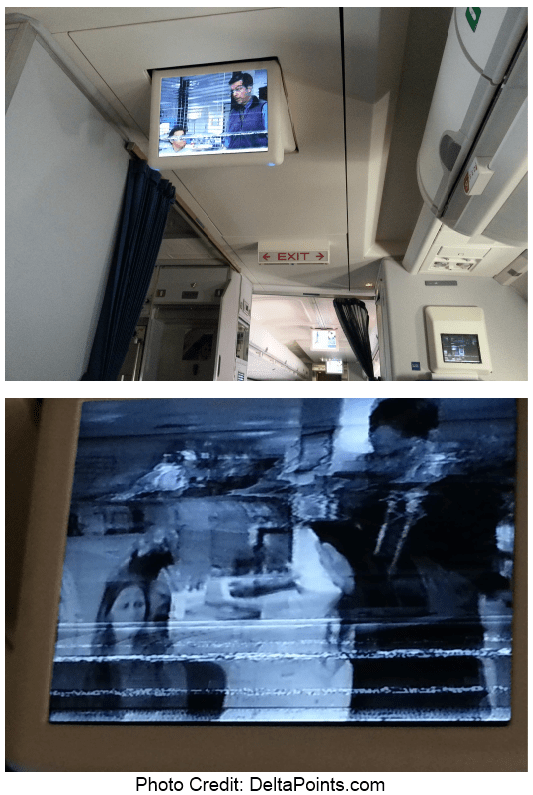 However, this old 757 still runs it’s inflight entertainment on VHS tapes and watching what was on was painful so I gave up (maybe I can get a few skymiles and maintenance can find an old VHS head cleaning tape)! The crew however were fantastic. The captain “floated” around pre-flight and chatted with those in 1st. The crew worked this short 2ish hr flight hard and never stopped smiling and the head purser even worked the coach cabin during the 2nd half and was just tops! I will be writing to Delta to commend this crew. ← They really shouldn’t let Delta bloggers out in public (where medallions are to be found)! Have Precheck and love it. I also had CLEAR and never got any advantage from using it so I ended up canceling it. Also in the future instead of going to the crappy United Club at DEN I recommend heading Woody Creek Cafe (or is it Bakery) in C Concourse. Good food and great employees. When I lived in DEN that was always my go to and trust me I used to fly out of DEN every other week so I’ve tried all the options. I do this flight at least once a week and usually the crew is very good. Must be the CO joy or so. I have Global Entry but as a permanent resident vs. citizen TSA doesn’t allow me to do PRE. I don’t get it. I can get from Brazil into the US without saying a single word except (welcome home) to anybody and I fly about 160 flights / year, but TSA can’t do a check to get me PRE? When PRE started, I somehow was approved to go through that line. Not anymore. I get thru usually with the TSA Precheck so I don’t think that I would spend the money for GE since I don’t have a card that will give me credit for it. We have both TSA Pre and GE. They’re both great! We are scheduled for our Global Entry interview January 31st. I plan to………. I travel lots overseas from homebase–IAH—- so I imagine it will be a good strategy. Enjoy the blog’s info on the subject. I signed up for Global Entry the first month it was available (and still working out the kinks). Has allowed me a few earlier flights home when I returned from International travel so worth it. I don’t live near a PRE airport so I’ve registered but have not yet used. Some day. I have Global Entry and this has well been worth the price. Most of my flights are international, so PRE is not allowed – or so a TSA agent told me. Love, love, love both Pre-Check and Global Entry. Pre-Check success rate over 95% of the time relieves so much of the hassle with TSA. Global Entry makes arriving back in the US a painless experience as well. No TSA Pre but would love to get it. I have my interview in march at BOS. Can’t wait to try it out in april. Dont have it but I’m thinking of getting it. Just applied for my Global Entry, can’t wait to try it out next month…. I have gotten TSA pre check as a result of PM status quite a few times. However, to get it regularly, I recently submitted my pre check application. App is approved, working on scheduling the interview. I have TSA Pre/ Global entry. Best thing ever. I’m based in DTWand just wish they hadn’t moved the TSA Pre line, along with SKY, upstairs. Not yet, but I plan to get it. Don’t have TSA Pre yet, but I definitely need to get it soon! I have it and DEN is home. Never more than 2 people in the Pre line. Big delay last week was the agent explaining to someone who only spoke Spanish that she had to go back to the regular line. I have TSA pre check – and it’s great. Signed up for pre-check, definitely getting Global Entry soon. Was going to wait to get United Platinum so they reimburse, but will just do it myself. I think I have TSA Pre already? Wife and I have GE, via Amex Plat. So, does that qualify is for pre without registering for anything? Downside for us, we are a family of six. Don’t know if we should get GE for the rest of the kids. That’s $400. Easier said and done. But, we do travel with them always. Pre-check is great and I miss it when I go to smaller airports that do not participate. I decided this year to take AMEX up on its offer of a free Global Entry pass and filled the app out last week. BTW, I also had a DYKWITIA moment flying back from Hawaii on my free Delta tickets bought with Skymiles. The line to security was at least 200 feet long and we walked to the front of the line…sweet! Just got my AmEx Platinum MR and defintiely planning to get TSA Pre and GE. I was surprised when TSA said I had Pre when I was going through security but have loved it! Only feel bad when my traveling companions don’t have it. The Fabulous Babe has it…but not me…Global Entry that is! I have American Express platinum and was reimbursed for G.E.. I like it!!!! Sounds good but can’t afford it in my young life right now. Applied for AMEX Plat on last AOR. Applied for Global Entry in Nov, approved in Dec. But my home base is JAX, so the nearest interview location is SFB, and the first available Saturday interview is April! I only have TSA pre, but I can see GE in my future! No easy way to get thru security for me…just part of the herd. I plan to get it this year. Don’t have it yet and rarely see a separate line for it,so not convinced its for me quite yet. I fly from non hubs most of the time. I fly 2-3 times a week. PRE is always a welcome site at the larger airports I go through. They have it at CVG, my home base airport, but not at DAY or CMH, my alternate airports when the fare out of CVG is too high. Have TSA PreCheck. IMO Global Entry is worth the $100!! Have TSA/Pre-check – definitely worth it getting through security lines at places like DFW and LAX. Not going to get it. Have GE but haven’t been able to use it yet. Thought about it. I only fly domestically and have not heard about it helping. Saw in the comments above about it not doing anything for domestic flights. Will keep reading about it. I plan to get Global Entry. I have been meaning to apply for TSA pre, just hadn’t gotten around to it yet. Thanks for the reminder, I’ll do it today. GE well worthy $100. TSA PreCk nice when available. Have and enjoy them. I have TSA pre check. Love getting those 3 beeps. Might go for GE if I ever uograde my AMEX to a card that will credit the GE fee. Until then TSA pre is just fine.. The only time my husband had to wait for me to go through security since he had his knee replaced five years ago was recently when we flew out of DCA. I only fly maybe 10 times a year but think it would still be worth it, so, long story short, yes, I am. Have GE and TSA Pre Check, definitely worth it. Just came back yesterday on US Airways Envoy class from Telaviv arriving Philadelphia and took me less than a minute to clear customs while my brother who does not have it stood 45 minutes in line. As for TSA Pre check i learned a new thing, I was informed by the TSA agent that you can,t use it if any portion of your ticket is an international flight!!! Have TSE Pre and GE – Love it! Only downside is flying out of an airport that doesn’t have it after you’re used to the perks of flying through security in less than a minute. Just got my AMEX Platinum, now my interview. I live in a small town, so have to chose where I want interview. 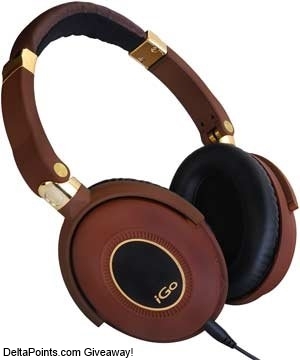 Also, looking at Bose Q15’s. give me reason to not spend that money today! have TSA Pre-check, so worth it! Don’t have it, but looking into it. It has made life much better since I can take the light rail in MSP and save on parking $18/day I was going to pay the 100 but did not have to. Spend it and love it!!! I don’t have Global Entry or Pre-Check, but do plan to get them. I tend to do my flying in clusters and have a lull right now. But I’ll be doing more this Spring. Your advice to invest $100 to get Global Entry is priceless. Everyone should be doing this and I’m glad you reiterate the importance of it in your posts and as examples in your trip reports. Thanks Rene. Not going to get Pre until it is available in my home airport, Milwaukee. Don’t have it, but thinking of getting it. I have been able to use the PRE line at fll and lga without doing anything special. With that said, I plan on us8n my platinum amex benefit to pay for my globall entry fee. American gave me PRE a a up while back so that works good when I fly American. I have Amex Plat. I did not know that Global Entry works for TSA Pre in the US. I thought it was only helpful with customs coming back from overseas. If this is the case I will sign up now. Pre Check lines are always dead. For me is is also the hassle of taking things apart. I have never had one single issue with PRE, yet on the regular line many times they are scanning bags multiple times etc. It seems the rookies and trainees are on the regular line also. Vegas has PRE, Miami, I have seen it at LGA also. Also keep in mind that even if you have PRE once every few flights you may randomly put back to standard scanner. You dont know when it is coming. I have TSA Pre Check and love it when I get the three beeps. It’s a little ridiculous that we have to now pay and apply to get the same travel security experience we had in the 90s, but it’s great having it. Last time I flew out of LGA, combined with Sky Priority, it got me from check-in to Sky Club in *literally* 4min. Also with American I had no interview just email questions. I thought Delta offered it to frequent fliers and they never offered it to me like American. Been a global entry member for three years now, was part of the delta pre check beta testing. Love it. I have not been selected just once. Last wed flying out of Bwi, had 40 mins to make my flight. Got to security with huge lines. Went to pre check and heard the magical three beeps. Took 30 seconds to walk thru security, made the flight with time to spare. Hubby and I both plan to get it. I plan to get the tsa pre. Don’t plan to get it – Not worth the cost to me at this point, but this may change in the future, as we will be changing our home airport to MCO, where it may be worth it in the future. I enjoy your blog since I’m a captive flyer with Delta, my only carrier. I don’t fly out oif the country enough to get global entry. Very interesting. I don’t have GE and not sure I will get it this year. Don’t plan to get it, but as my wife said above, things will be changing so we may consider it. Just got it last month. First used in LGA went through the line in 5 minutes. A must have..
Pre is the only way to go. FYI! If you are flying out of DCA on the early flights the Pre line does not open the same time as the regular lines. Some times it may be up to an hour later. I plan to go with TSA Pre in the next couple of months. I’m planning a churn that includes the Amex Plantinum. Wish I’d done this last year as I visited nearly 20 countries in 8 months… better late than never. Mo plans to get one as I won’t be flying as much this year, but it does come in handy. i have it and dont know how i lived without it! I have Global Entry, had Clear but wont renew because of tiny amount of airports that have it plus the expense. Love TSA pre. Wish it was more uniform, faster and cheaper. My friend has pre check and global entry and said it has been the best thing he has done in years. I plan to apply next month especially since my home terminal is DTW. Don’t have it and not worth it (yet) to me. Not yet, but I plan to get it this year. Got the Amex Platinum from the recent 100K promo so might as well get the global entry this year. I have and love TSA Pre!! It makes me feel like a rockstar! YEAH! No, I don’t have it but I plan on it. Have it – its awesome when you are at an airport where it is available. Alas not yet here for the Delta T1 gates at SFO. Just discovered your great website and newsletter. Thank you for the best info. Don’t think TSA pre is available at SAN or I would invest! Have it & love it. What is the difference between the Global entry and the Nexus pass. What does having an “interview” mean. I would LOVE to get TSA Pre for hubby and me! I have Pre-Check on United but have only had the opportunity to use it once (it was good then). I will get the GE when I can spend time in an appropriate airport with a lay over long enough for the interview, but this hasn’t happened yet. I have Precheck. With the long LAX lines, makes life so much easier! Can’t wait for more airports to be added! I signed up for Pre-Check on United but not used it. I intend to get the Global Entry interview when I can layover where they interview. I hate the long immigration lines. Dont have but going to get it! Planning to get, after AMEX Plat in next AOR. I do not use international flights that often right now, but will definitely sign up for Global Entry when I do start more international flying. Got that Pre on lock since it rolled out to MSP. I have pre check and like it, but it is not at my home airport. I will get Global Entry. I have Precheck and love using it when it’s available…unfortunately not at my home airport yet. Global entry alone is worth the fee. I planned on getting it, but I changed to a non-traveling job before it came to MCI and STL. I still love sitting in a quiet room with an audio book or a movie, it kind of reminds me of quiet travel sometimes. still waiting for the 3 beeps…..
Love Pre-Check! However, in Seattle it closes at 8pm. Planning on getting TSA Pre this year as I’m doubling my amount of work travel this year. I dont but going back and forth through Toronto I am seriously considering it. Have Pre and never want to give it up. It brings back the way flying used to be. Have it but haven’t had a chance to use it yet (just got it last week). i really do want it but convincing my husband to spend the money and time will be the tough part. intend for it to happen this year. upset about Delta new rules. No plans to get either as of now. Have my PassID and will finish the process at ATL the end of February. Yes, have Pre-Check, it’s great. A few people seem to be confused about Pre-Check vs Global Entry. Here’s the deal: You may have been invited by your airline to participate in Pre-Check. That is fine for that specific airline. Global Entry lets you use Pre on *any* airline which has it, even if you were not invited. In addition, GE gives you expedited customs clearance when returning to the US and also when entering a couple of other places. GE is a much more extensive application process and requires an in-person interview. I’d like to get Global Entry after I apply for Amex Platinum. I hope to get TSA Pre this year. No, don’t have TSA Pre at this time. If I travel more, I may apply simply because of Rene’s excellent recommendation. I have applied for my Global entry, AMEX Plat re-imbursed almost immediately. I have to wait 3 months for an interview though. I was one of the first Delta invited for PRE and took them up. I used it the first day available in both SLC and DTW. This is what security should be like at all airports. I have it via Global Entry. I haven’t heard about TSA Pre before. I remember after 9/11 when, as a Government employee, I could get into some other similar program for free. I loved it, because at the time I was flying ALL the time (I flew three days after 9/11. Talk about an empty plane). I’d enroll in a similar program, dependent upon how much it costs and how much I plan on flying in the future. Have never thought about it much but am now seriously considering getting TSA Pre. I don’t recall Delta ever *inviting* me to join pre-check, but at LAX, for the past year, they’ve always scanned my boarding pass, and then put me in the pre-check line. But that’s only happened on Delta. So I took your advice, and applied at GOES a couple weeks ago. I have my appointment scheduled in 2 months. My interview is February 14th, paid for by AMEX Platinum card. got the card last year but passport expiring so must get another interview…we were in bos for sandy and when the sirport opened up we go there early to get a new re-booked flight to ohio to atl to jax and no one was in the TSA line..we showed the guy our Pre Check card and he said it can go to the fast track line we declined and stayed in the regular line as we were the only ones in the line so fast enough for us…. I don’t have it but would love to get it. Don’t have it, but would love to get it eventually. Got it through Amex Platinum card and love it. Have it and like it! We’re planning on getting Global entry soon, before our next OS flight in August. I’m Australian/US resident and hubby is US citizen so we’ll see how it works. Thanks for the great blog. I have it. Works great in Minneapolis. $50 and then Global entry is free. If you live near a Canadian border, it is a better deal. Alas,I’m not not going to get it because I’m not American.